This is the first time a high-definition camera has been placed on the ocean floor that is capable of delivering the video signal in an uncompressed format over an Internet-style 10 GB/second fiber optic network. The hardware did not exist until now. To turn it on, have the systems work flawlessly, and to get data immediately was exhilarating. 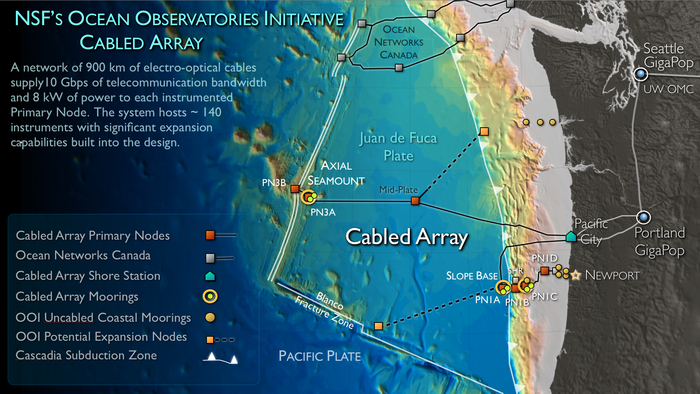 The University of Washington's Cabled Array of the NSF OOI extends continuous high-bandwidth communications (tens of Gigabits/second) and power (tens of kilowatts) to a network of instruments widely distributed across, above, and below the seafloor in the northeast Pacific Ocean. As the world's first ocean observatory to span a tectonic plate, this facility provides a constant stream of data in real time from the ocean, on the seafloor, and below the seafloor within the Juan de Fuca plate. The oceans of Earth are crucial to the quality of life on land. Yet they are mysterious, dangerous, and unexplored. The mission of the NSF Ocean Observatories Initiative is to launch a new era of human discovery within the world's oceans through electrical power and high speed internet connectivity in large portions of the global ocean. Land-based scientists, engineers, educators, and the public can interact remotely with ocean events as if they were actually in the ocean environment  events such as erupting volcanoes, migrating fish, major earthquakes and storms, powerful currents, blooms of microscopic life, and subtle climatic variability. Location of high power and bandwidth moorings with profiling capabilities on the Cabled Array. 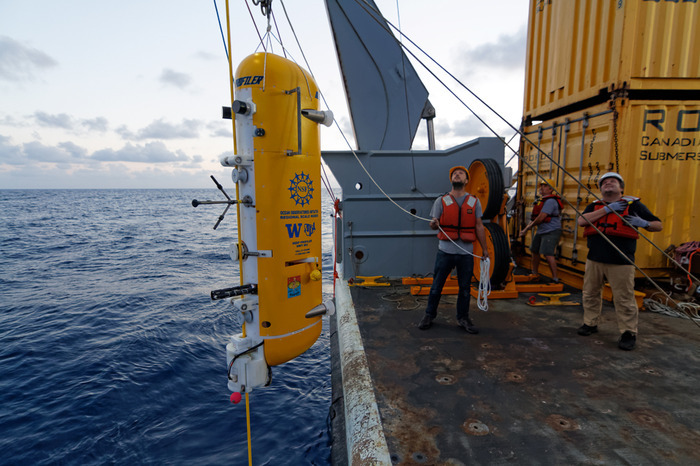 One mooring will be placed at the base of Axial Seamount, providing measurements key to examining flow over rough topography, El Niño and La Niña events, and the Pacific Decadal Oscillation. A second mooring will be located at the base of the accretionary margin outboard from Hydrate Ridge. This mooring forms an array with three surface and three subsurface (two of which are cabled to the network) moorings that are part of the Coastal Scale Endurance Array. Paper detailing the cabled array. Presented at the Offshore Technology Conference, May 2016. Poster presented at 2016 Ocean Sciences Meeting. Careful surveys of the scientific areas of interest and cable route planning in 2010 and 2011 by the UW Team (School of Oceanography and APL-UW) were a first step in the successful installation. The UW team developed the concept and managed the contractor L-3 MariPro to design, build, and install the primary system: 900 km of telecommunication cables and seven primary nodes. All primary nodes were placed in safe locations, with distribution of power and communications to instrumentation left to the UW team. EPS engineers simultaneously began designing and building the secondary infrastructure consisting of junction boxes that provide 130 instruments with power and communications connections. During the summer seasons of 2013 (52 days at sea) and 2014 (82 days at sea), over 22 km of secondary cable were laid, the 17 junction boxes and six moorings with 130 instruments were installed and connected to the primary system. By early 2015, APL-UW had real-time, two-way communications with instruments placed across the Juan de Fuca plate in the northeast Pacific Ocean. The goals of VISIONS ’15 and VISIONS ’16 were to provide maintenance to this cabled infrastructure. The tasks included the planned recovery and reinstallation of a number of the instruments and all profilers. This video from the 30-day cruise highlights many of the complicated ship and ROV operations required to work with equipment on a cabled array. 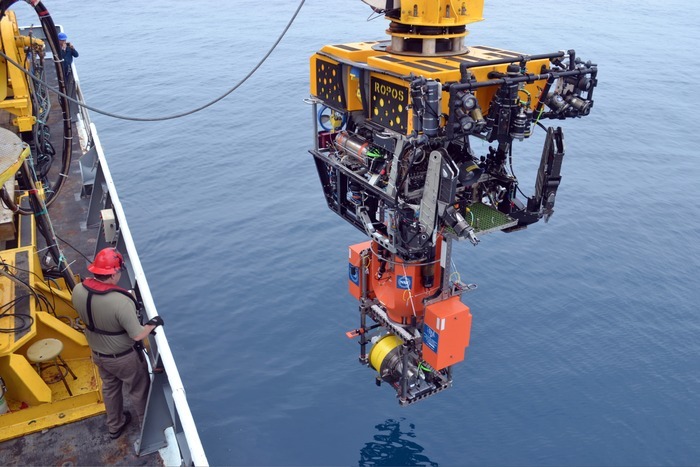 APL-UW uses remotely operated vehicles (ROVs) to install and service instruments on the seafloor, as well as profilers. 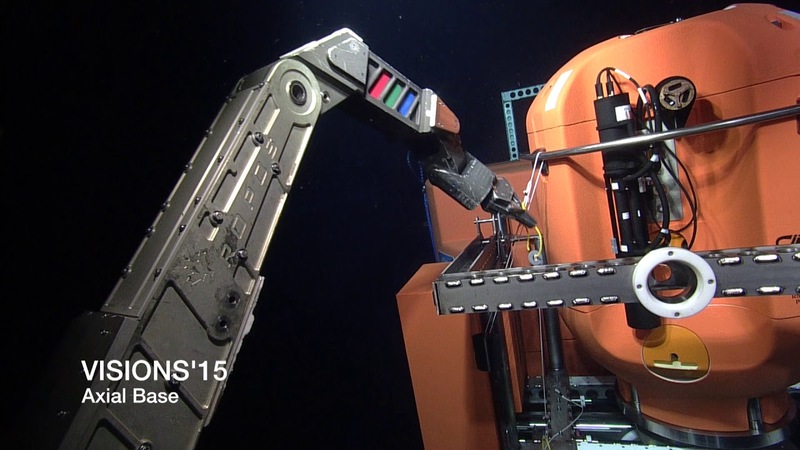 ROVs are essential because they can reach depths that divers cannot, as well as easily lift the 15003500-lb. packages. 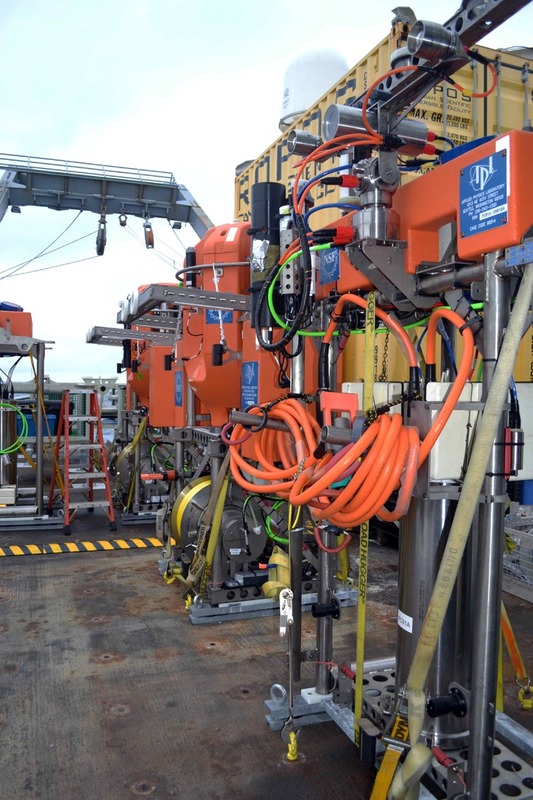 APL-UW has deployed over 100 instruments on the seafloor and in the water column. Nodes and junction boxes (J-boxes) are used to distribute electrical power and telecommunications bandwidth to a wide range of deployed sensors and moored profilers that span the entire water column of the northeast Pacific Ocean. There are three different types of J-Boxes: low-power and medium-power junction boxes, and low-voltage nodes. Different J-boxes are configured for different instruments based on their power requirements. Currently, there are 17 junction boxes on the Cabled Array that have been operational since 2014. Shallow profilers are located at three different locations; all are supported by two-legged, subsurface platforms. These cabled vehicles host a variety of instruments and measure water column properties in fixed geographical locations for a long period of time. 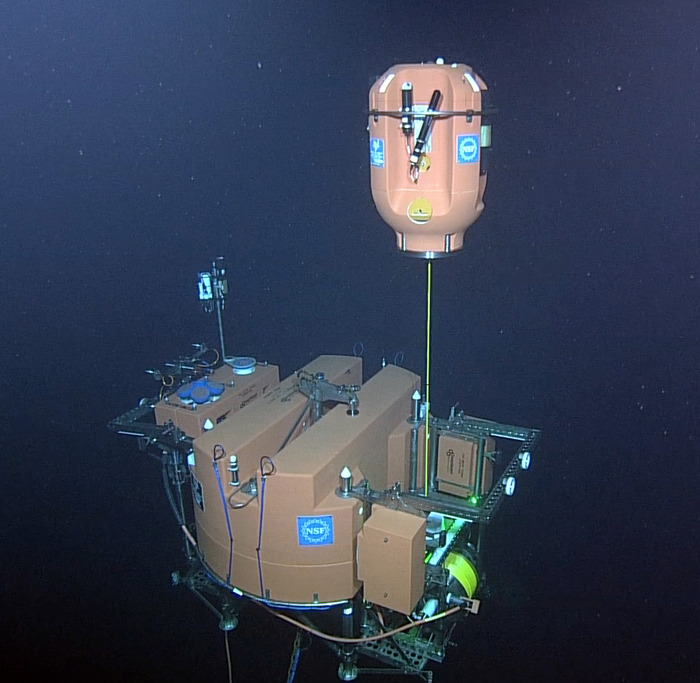 The Shallow Profilers move vertically to just below the ocean’s surface to collect oceanic data within the water column. The data collected includes chemical, physical, and biological properties within the ocean. Each shallow profiler is paired with a deep profiler. This wire-crawling instrument is based on the McLane moored profiler, but is heavily modified by APL-UW engineers to equip it with advanced capabilities. It now has an innovative inductive coupling system, extended deep-sea range, and an expanded instrument payload. The deep profiler starts at the seafloor (as deep as 2900 m in one location) and then travels to just below the surface. While traveling (about 25 cm/s), the sensors measure oceanographic properties and collect data going both directions, allowing periodical subsets of data to be sent through a Wi-Fi communication link to the shore base in Oregon. Directly below the deep profiler is a docking-station on the seafloor. 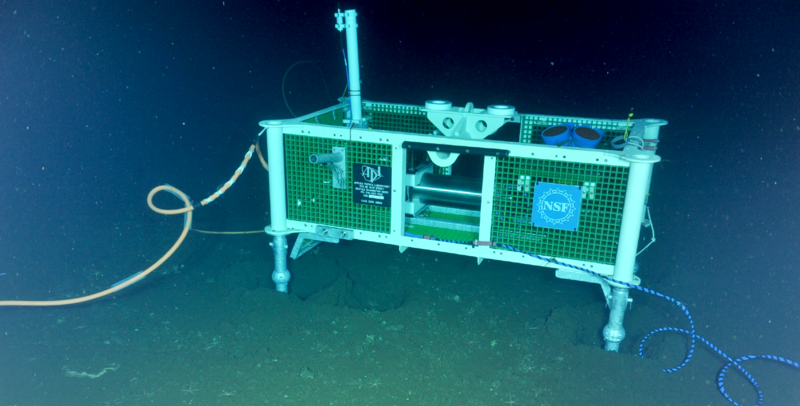 Once a week, the deep profiler docks itself at the seafloor station, recharges its batteries, and downloads the full set of scientific data collected over that period. The OOI system was designed to answer a set of major science questions, developed with the input of over 300 scientists. Each segment of the OOI addresses a subset of the questions. 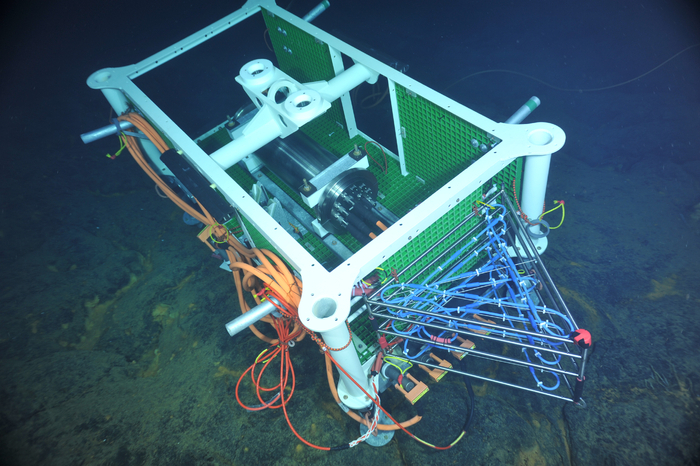 The Cabled Array addresses questions invoking the use of seismometers, mass spectrometers, geodetic measurements, and a unique set of instruments that only operate in the hydrothermal vents of undersea volcanos. The Cabled Array is also unique as the only segment offering 24/7 streamed data from nearly all sensors. 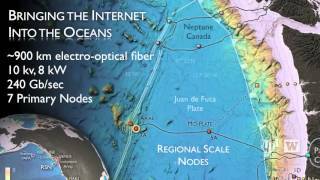 The oceanic data gathered are sent through a variety of telecom, sub-sea cables, which are made from fiber-optics and copper. The cables, laid out on the seafloor by cable ships and ROV, provide a two-way communication system between the nodes and the shore station in Pacific City, Oregon. From there, the data stream is transmitted to the University of Washington and onward to users worldwide. 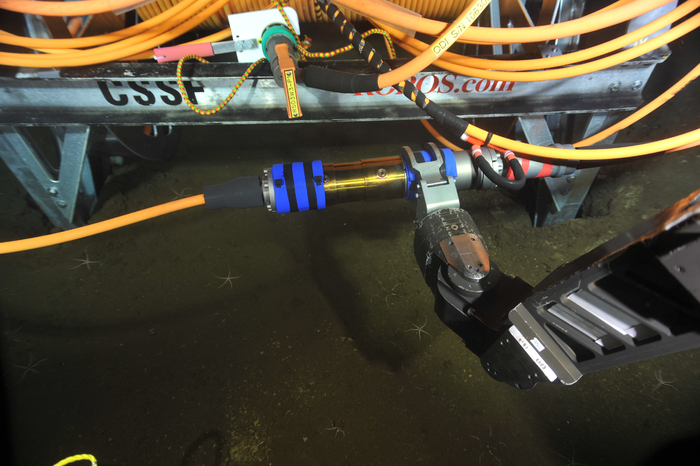 Cables are joined to instruments by wet- and dry-mate connectors, allowing live data to travel through the cables to the shore station. Because wet-mate connectors are uniquely designed to couple cables and structures under water, they are the most commonly used during cruises and ROB operations. They also prevent salt water from entering the cables, which helps avoid early corrosion and reinstallation. Dry-mMate connectors must be assembled above water. With new, innovative installations of instruments every year in the northeast Pacific Ocean, APL-UW will continue to help resolve our ocean’s mysteries. With each future cruise, we strive to look deeper into the ocean’s currents, active earthquake zones, sites of new seafloor creation, and the rich environment of marine plants and animals. When an underwater volcano erupted in April off the Oregon coast, researchers knew within minutes that something spectacular was happening more than 300 miles offshore. Precision hardware installed by the University of Washington last summer let scientists see its effects almost instantly from shore. For the first time, scientists can hear and monitor an underwater volcanic eruption as it happens. These observations of the Axial Seamount volcano are possible because of the 600 miles of fiber optic cable and 100 instruments installed by the OOI-RSN project off the Oregon and Washington coast. Imagine having a collection of all the data on the ocean at your fingertips. The Regional Scale Nodes (RSN), a project that was conceived in the late 1980s, can make this happen. Nearly three-quarters of Earth is covered by ocean water, yet only 5 percent of what is beneath the shimmering blue waves has been explored. The dearth of information isn't because of an apathetic scientific community. Until a few years ago, technology needed for leaps and bounds in ocean exploration didn't exist. And the large, fickle oceans have a way of complicating research efforts. 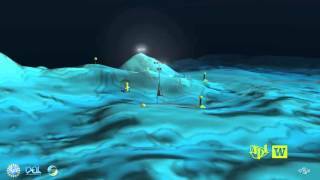 A massive digital ocean observatory will include a new generation of ocean explorers: robots that will zoom up and down through almost two miles of ocean to monitor the water conditions and marine life above. Scientists, engineers and students will be at sea from July to October 2014 to finish installation of the high-tech facility, which will be the world%u2019s largest Internet-connected ocean observatory. Resting on the sea floor 300 miles west of the Oregon Coast are corals, fish, crabs, and now  thanks to researchers from the University of Washington  14 miles of cable hooked up to sensors, seismometers and an HD camera. 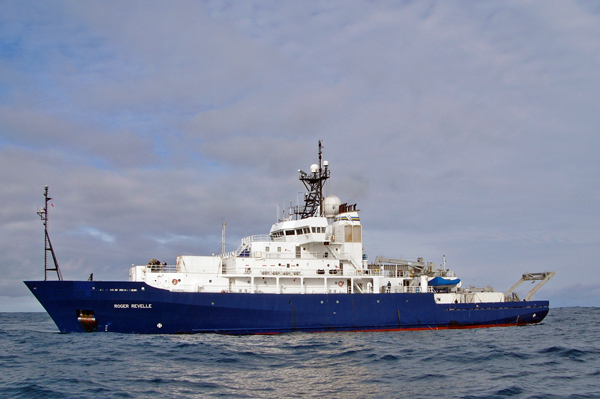 The University of Washington research vessel Thomas G. Thompson is loading up for six weeks at sea. When the team returns to Seattle in late August they will have extended the cabling to key research sites, an important part of building the first real-time, continuous eye on the mysterious creatures, currents and geologic forms in waters off the Pacific Northwest coast. 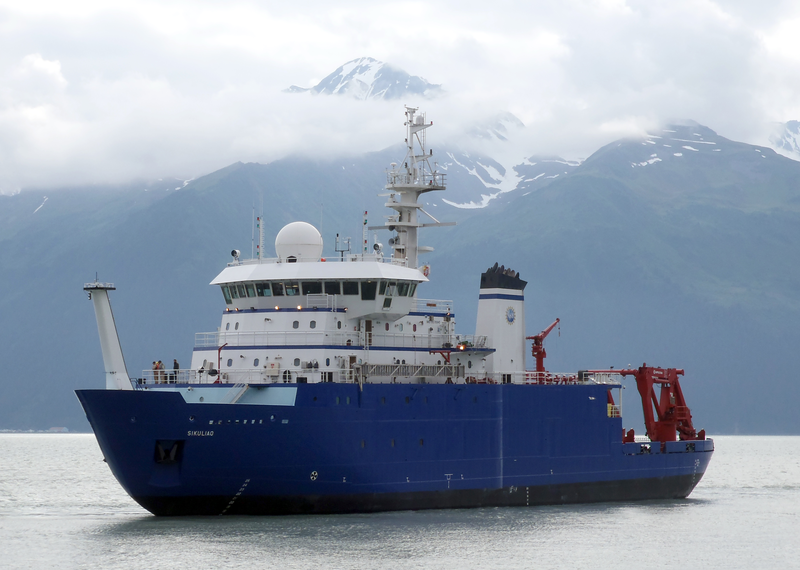 The R/V Thomas G. Thompson is ready to sail with a portion of the 570 miles of fiber optic cable that will turn the ocean floor off the northwest coast into a research paradise, and not just for scientists. In further news about awesome people doing awesome things, a team from the University of Washington is installing a series of nodes on the sea floor  something akin to a "giant electrical outlet" the size of a Volkswagen Beetle  to provide Internet connectivity and power for real-time observations of the ocean. This spring, there was a big volcanic eruption in the Pacific Northwest. It happened under the ocean off the northern Oregon coast. 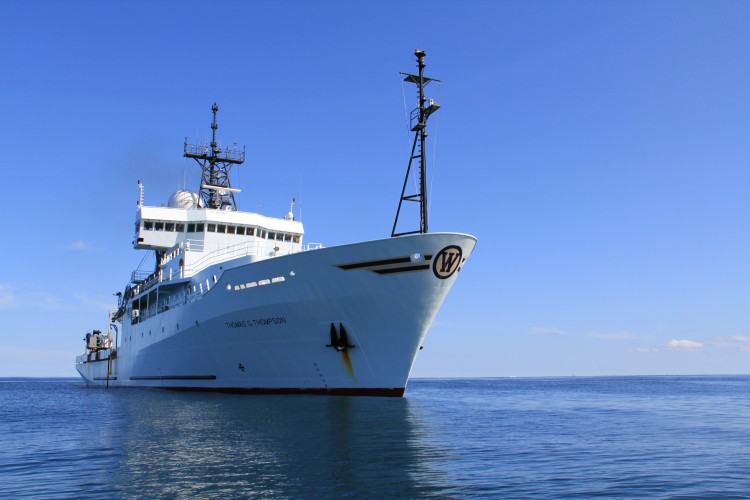 All this week, a University of Washington research ship is streaming live video via satellite of lava flows in the undersea crater.